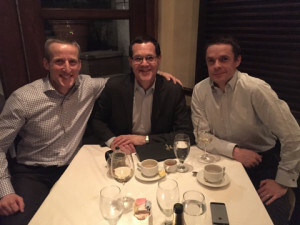 Alastair MacDonald, Managing Partner, and Frank Keane, Partner and Head of International Business at EisnerAmper Ireland, travelled to the US in January 2016 to meet with colleagues in EisnerAmper LLP’s New York office. During their visit Alastair and Frank also met with clients of EisnerAmper Ireland in addition to meeting with members of IDA Ireland. The trip also provided an opportunity for Alastair and Frank to meet with members of EisnerAmper Ireland’s team currently on secondment to EisnerAmper LLP. You can read about the experiences of EisnerAmper Ireland’s US Secondees here.